Grating interferometry based hard X-ray phase contrast can provide superior contrast, especially in soft tissue, when compared to conventional attenuation based imaging. At the same time, grating interferometry also provides a dark-field image that can show details both in biomedial and material science applications. Figure 1: Saggital slice through a rat brain. (a-c) reconstruction of the gradient vector field of the refractive index decremment δ. (d,e) reconstruction of δ and improved reconstruction due to the tilted gratings. (Figure from ). Figure 2: Directional scattering signal of an ant. (see also ). Especially since the first demonstration of phase contrast imaging at a conventional X-ray tube source in our lab , X-ray grating interferometry has become a popular research subject. Further experiments at our lab sources include the demonstration of grating interferometry based dark-field imaging , as well as developments in biomedical imaging such as the phase-contrast tomography of human hands [3,4] as well as the clinical evaluation of grating interferometry in mammography applications [5,6]. In recent experiments at synchrotron sources, we have shown two ways of recording the full differential phase gradient vector. 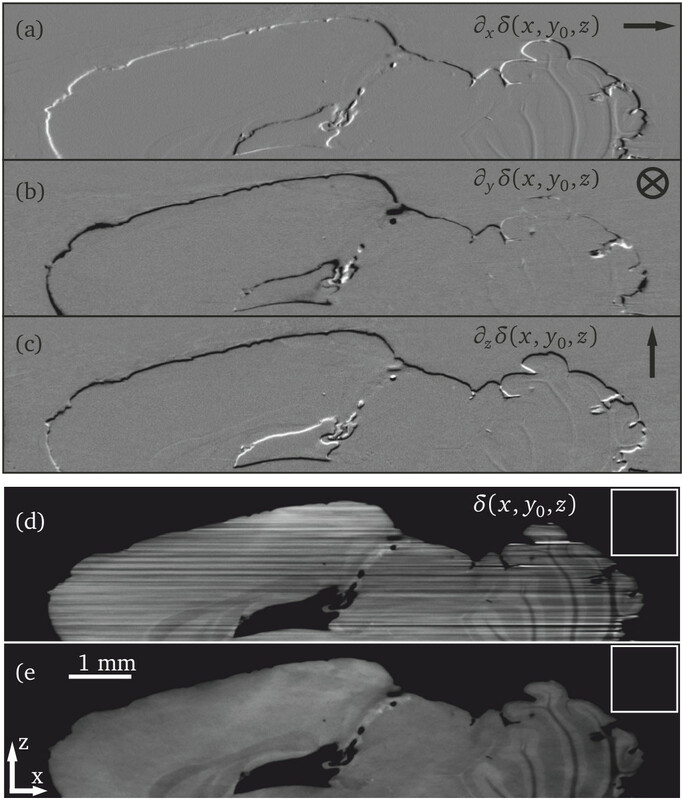 One approach, using tilted gratings works well in tomography using one-dimensional line grating structures and can lead to improved tomographic reconstructions  as shown for a saggital slice through a rat brain in Figure 1. The other approach to record the full phase gradient vector is based on two-dimensional grating structures that can be fabricated using deep reactive ion etching. This approach is well suited to radiography and can provide a differential phase signal in two directions, as well as a directional dark-field signal [8,9,7]. 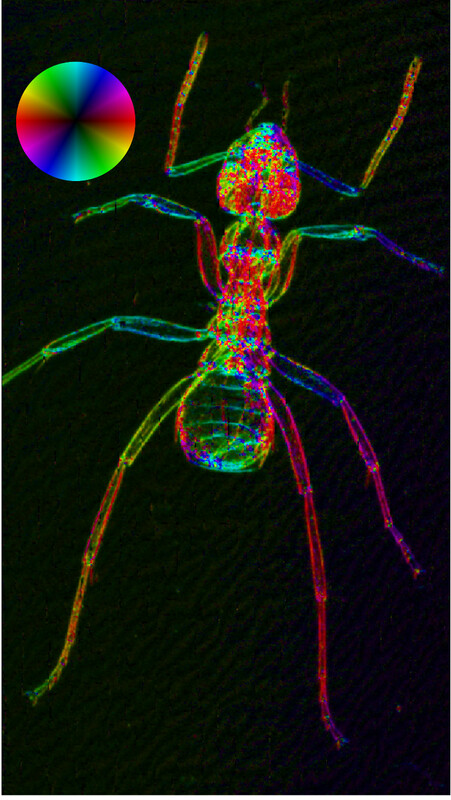 An example of such a directional scattering image of an ant is shown in Figure 2. This method also has interesting applications in in-situ X-ray optics metrology.